The Blennerhasset Hotel got me to Parkersburg, West Virginia. It’s elegance, Sunday brunch and package deals will bring me back. I found this historical, boutique-style beauty while searching for a new place to stay near Athens, Ohio where my daughter goes to college. The Mead House, a charming bed and breakfast in Nelsonville was last year’s overnight during Ohio University’s sibling weekend. As parents know, when one child visits the other, its time for a parent getaway. This year, like last, when we dropped off our son at our daughter’s dorm, we waved good bye and headed out. 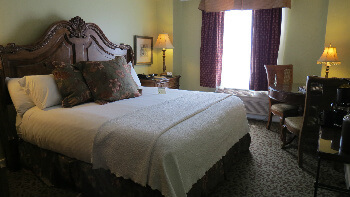 Parkersburg, West Virginia, just 45 minutes from Athens was a doable jaunt, and the Blennerhasset Hotel a wondrous find. 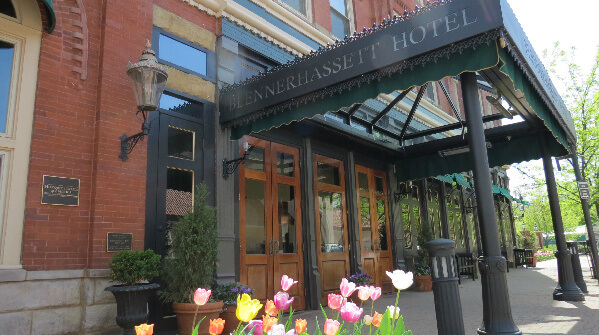 First opened in 1889, the Blennerhasset Hotel is a registered National Historic Landmark hotel that remains a downtown centerpiece. When it first opened, Blennerhasset’s European-style elegance drew guests in. These days, the elegance and service remains a calling card, as well as its affordable luxury. Its within walking distance location to most of Parkersburg’s attractions is another plus. In between our sightseeing, our King room was a lovely respite of brocade fabric and polished wood details. The bathroom, with its granite vanity and Italian tiles added to the upscale ambiance. The rest of Blennerhasset evoked the same European style charm. Along with our room, I was attracted to the hotel’s lounge and restaurant to the right of the lobby. 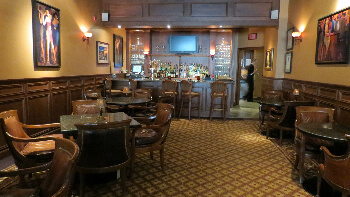 Spats Restaurant and Lounge offers both casual and upscale dining. After a day of Parkersburg attractions, I settled into one of the lounge’s leather chairs to savor a glass of wine and enjoy the ambiance and the assorted guests that included a young couple who arrived wearing wedding attire. 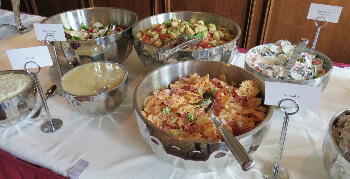 After we checked in, we made reservations for Sunday brunch, a sumptuous buffet bounty of everything from freshly made salads to oysters on the half shell to eggs Benedict and gourmet omelets made to order. I did manage to leave enough room for berry cobbler and a sliver of cheese cake, but just barely. During Sunday brunch, served from 11 am to 2 pm, a pianist plays the grand piano shared by the lounge and restaurant. As for our deal, I booked the room as a Spring Fling package which included a $20 gift card for use anywhere in the hotel plus two Grande drinks at the Starbucks in Blennerhasset’s lobby. We used our gift card for brunch which left us with a brunch bill of $15 and some change. Although the Spring Fling is no longer offered, there’s another sweet deal. The 1440 Minute Escape Package available for a weekend stay includes “Signature sweets” when you arrive and a $100 spending card in the hotel. Along with Spats Restaurant and Lounge, you can use your card at Starbucks or at the hotel’s gift shop. This package runs $199-$369 depending upon if you are booking an intermediate room with two double beds or an executive suite. A Deluxe King with this package is $229. As a warning, Starbucks and the gift shop closes at 3 pm on Sunday. We found this out when we went to claim our two coffees with plans to take them with us on our trip back to Ohio. Starbucks had just closed. Instead, we were given coffee to go from the restaurant. This suited us just fine. Hotel amenities include a fitness center and complimentary Wi-Fi. Parking is also free. By the way, when my husband threw open the trunk of our car in front of the hotel prior to check-in and exclaimed “Where’s our luggage?” (neither of us took the extra step of taking our suitcase from our house to the car) the staff was quite helpful in giving me directions to Parkersburg’s mall. Happily, Belks, a department store similar to Macys or Dillards, was having a terrific sale. In case you want (or need) to shop, the mall is about a 10 minute drive from downtown.